Nifty Technicals - Will it Solve the Mystery??? You are here: Home / Commodities / Nifty Technicals – Will it Solve the Mystery??? Nifty Technicals – Will it Solve the Mystery??? feel that its a big game of operators to squeeze the shorts of small traders. analysing all the hourly,daily,weekly charts of nifty to come up with my conclusion. resistance in 4385-4395 zone. And as per this chart maximum upside is possible upto 4440 for this week. So I try to figure out Nifty Daily Charts. Looking at daily nifty charts there is not conclusive buy or sell signals. 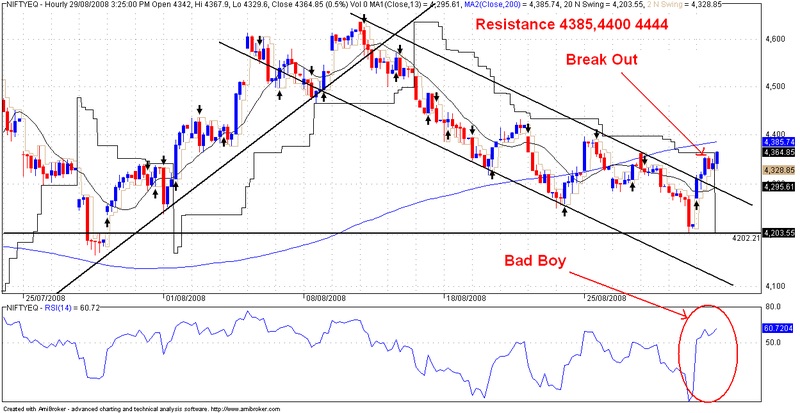 Daily Nifty Charts resistance are coming nearly 4400.
a Strong Reversak Pattern with falling Stocastic Indicator. on Daily and Hourly Charts. Just taking some longer duration charts. upmove about 3% close on last friday looks quite unusual. Let See How this twist ends.